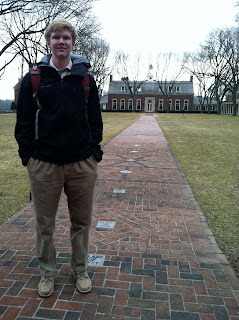 Welcome to the Headmaster's Blog where you'll find updates, thoughts, and events regarding Saint David's School, the education of boys, and other items of interest. This is by no means meant to be a complete account of all that happens at Saint David's. Please refer to the school's website for more complete details -- it's more a Headmaster's musings. The Saint David’s baseball coaches attended the Ripken Baseball Coaches Clinic at Hofstra University on Saturday, February 25th. The clinic was given by former major league baseball players Bill Ripken, John Habyan, and Hall of Famer Cal Ripken Jr.
Saint David's coaches spent six hours in the clinic, introducing Coaches Learn, Imbelli, Roman, Arias, and Byrnes to baseball the Ripken Way: Keep it Simple, Make it Fun, Celebrate the Individual, and Explain the Why. The coaches, who enjoyed their time at the clinic commented that, "Cal, Bill and John covered every aspect of the game, moving through the fundamentals required for success to the advanced drills that can give our players an edge." Drills the coaches learned at the clinic have already been incorporated into the baseball curriculum and will benefit our players and their coaches throughout the season. 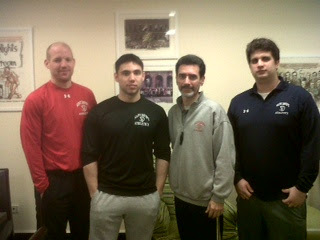 Pictured are the coaches who participated. Missing from the picture is Coach Arias. Our program rigorously pursues skill and sportsmanship, because our coaches rigorously pursue exceptional coaching practice. 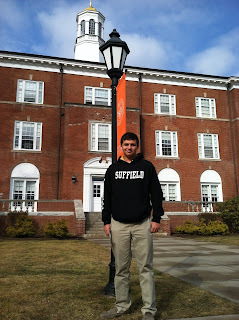 I traveled north through Connecticut Wednesday to visit alums at Loomis and Suffield. It was a beautiful and rather quick drive. Arriving first at Suffield, I met with Daniel '11 in the newly constructed Counseling Office. We had a great chat about Daniel's transition to HS, ways to improve Saint David's, and what he would never want to see change about his Alma Mater. Daniel is most proud of his qualifying for the North East Championships in Wrestling; although he's not sure he's going to compete. Billy '08 was away at a ski meet. At Loomis, I sat with Lawson '10. Over lunch we discussed the challenges and rewards of his second year away. It was an enjoyable free ranging conversation. Lawson's advice for those considering boarding: "Be yourself. Don't try too hard to fit in. It all settles out." Wise counsel. Today, before a packed house in Hyman Hall, 7 Pi performed the second of Aeschylus' three tragedies that capture the events succeeding Agamemnon's return from the Trojan wars. The "Oresteia," the trilogy, is probably Aeschylus greatest work. In essence, Libation Bearers tells the story of Orestes, played incredibly powerfully by Julian, conspiring with his twin sister Electra (played confidently by Khalid) to avenge his father's death and bring honor to the doomed house of Atreus. Those familiar with the myth will remember that Clytemnestra murdered her husband, Agamemnon, in retribution for his sacrifice of their daughter Iphigenia so as to obtain favorable winds during the initial Greek voyage to Troy. Clytemnestra plotted for ten years to avenge her daughter's sacrifice. Libation Bearers picks up the story seven years after the murder of Agamemnon, with the long awaited return of Orestes, his son, from slavery--slavery imposed upon him by his own mother. You can tell acting is superb when all the audience turns to see what the actor is looking at in back of the theater when he speaks of seeing the "Furies" before him; but there is nothing there. 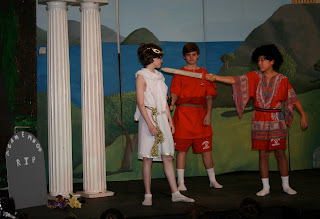 It was an exceptional performance by the cast. In the scene above, Orestes confronts his mother, Clytemnestra, for the first time after escaping from slavery. Underlying themes include justice and the evolution of trial by jury for the ancient Greeks. 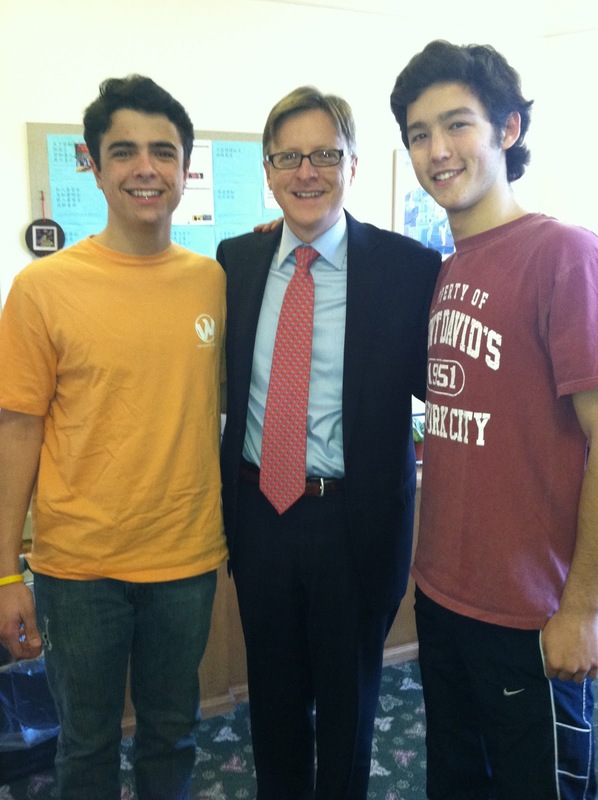 Franny, '11 and Danny, '11 visited the school today, catching up with many of their teachers. They also stopped by my office for a chat. Both are enjoying high school tremendously. Franny is at Deerfield and Danny, Suffield. It was fun to catch up and hear their stories of success. For the first of February it is a remarkably beautiful, balmy day -- almost unbelievable! Hats and sunglasses would have come in handy on our trip into the hills of Riverdale today. 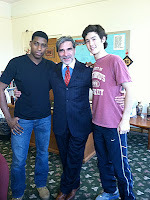 Three Saint David's alums currently attend Fieldston: Shakeel '08, Sam '09, and Henry '10. Mr. Imbelli and I had the pleasure of meeting all three for a roundtable conversation. Sitting around a harkness table, the five of us enjoyed a rather expansive and quite candid conversation about the boys' experiences at Saint David's, their transitions into high school and their lives today. 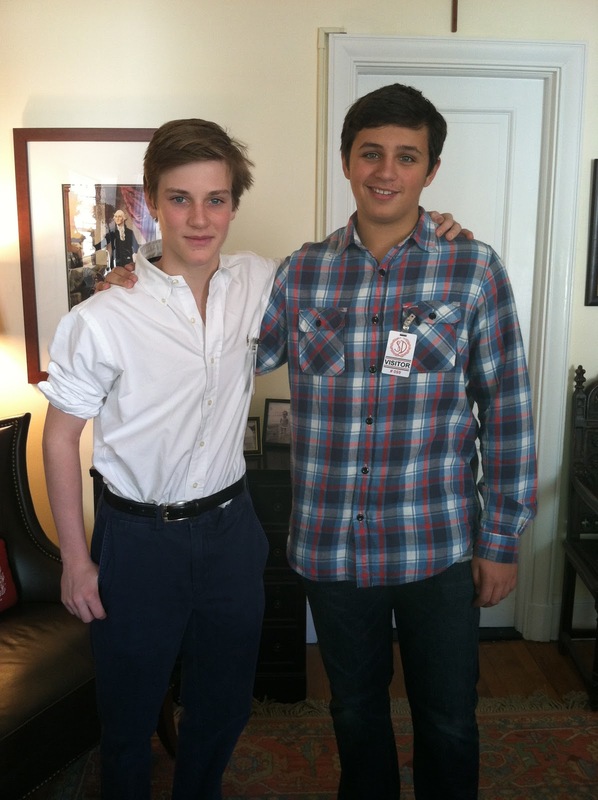 In response to a question about something they would never want to see changed about Saint David's, one of the boys responded that Saint David's gave him "a really strong fundamental base" and that he wouldn't want "that to change." In probing a little deeper, I asked him to define what he meant by strong, fundamental base. In response, he spoke about tradition, religion, and the school's emphasis on structure, and then he said something not just reassuring, but quite telling: "We know the mission and always will." "I always come back to visit--it's the relationship with the teachers and the people." It was an enjoyable and productive visit. Happy Birthday to Bob McLaughlin!